We’ve discussed in one of our previous posts how many diapers a baby uses in a day. In this particular post, we’ll be focusing on which brand of diaper most mommies prefer for their little ones. Forget about cloth diapers for now. They used to be the “in” thing, but there’s no question that disposable diapers are what most mommies prefer nowadays. If you’re wondering which are the best diapers to choose from for your bundle of joy, you’ve come to the right place. Choosing a brand of diapers can be daunting. There’s a sheer number of options out there that can leave you confused. To help you find your family’s “go-to” diaper, here are our top 5 picks. 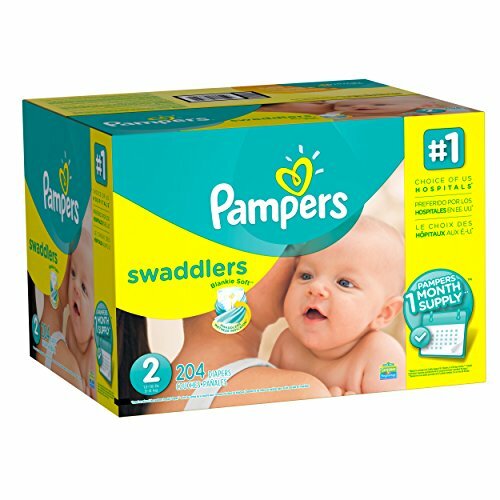 The Pampers brand is an all-time fave among parents all over the globe. It’s a familiar name and is known for the comfort it offers. The Swaddlers, just like other Pampers diapers, come with a wetness indicator that lets you know when your child may need a change. It also has an “absorb away liner” that keeps wetness away from the skin, helping your baby stay dry and comfortable. For the NB-2 diaper sizes, newborns can enjoy a contoured umbilical cord notch. The color-changing wetness indicator helps a lot in making sure your baby is not soaked. The material is soft and very comfortable to the skin; it also fits well even to smaller babies. It becomes saggy when full, but not bulky. The back part may need some more elasticity to prevent gaps when your baby is moving around. Just like Pampers, Huggies is an attractive, traditional line. 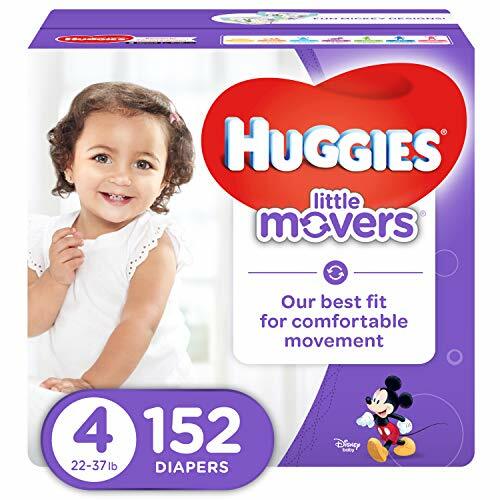 Their Little Movers are particularly amongst the most popular variations, which are very absorbent and fit well. As the name suggests, this diaper is designed for babies who move a lot. With its Double Grip Strips, you can fasten the diaper at four points and make sure it doesn’t fall off. It features a Moving Baby System that keeps the diaper intact during activity. It also comes with a DryTouch liner that absorbs wetness on contact. The diaper comes with stretchable straps making it able to keep up real well with all the baby’s activities. It doesn’t quickly sag on the initial wetness. Little Movers have recently been updated with a wetness indicator feature, warning you when the diaper is already full. The strap may be a bit stiff and may cause irritation to baby’s skin. The strap easily gets pulled off when tugged too hard. Since this diaper is designed for a roomier fit, you may have to go for a smaller size to make sure it fits, especially if you have a small child. BAMBO diapers are specially designed for parents who are eco-conscious. The idea is to make disposable diapers that are safe for both children and the environment. 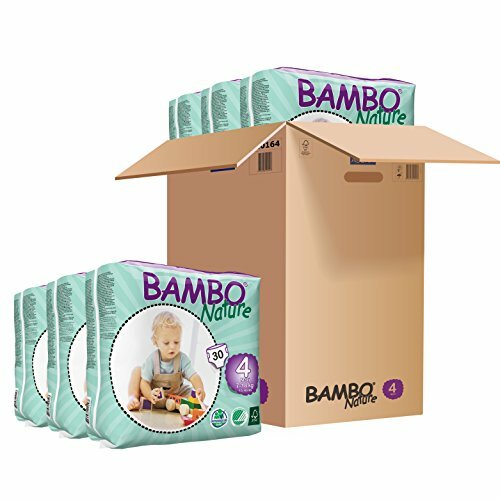 To date, there are no other diaper brands that have more eco-labels than BAMBO. The company claims that their products do not contain any dangerous chemicals, allergens, and perfumes. They also claim to use only sustainable resources and produce less waste in the production of their diapers. Their diapers carry the Nordic Ecolabel, the Danish Asthma & Allergy Association Label, the Forest Stewardship Label, and a Dermatologically Tested label. The diapers are thin and light, yet durable and do not rip off easily. This is an excellent choice if your child has some sensitivities. This is a good option if you’re worried about the environment since it lacks harmful chemicals and scents found in most disposable diapers. Due to the health and eco-friendly claims and credentials of this brand, it’s a bit pricier than other leading brands. 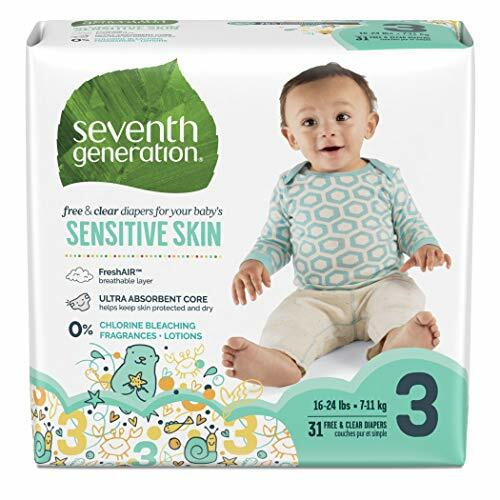 If you’re looking for something similar to BAMBO that’s eco-friendly but less expensive, Seventh Generation diapers might work for you. These diapers are specially made for babies with sensitive skin. They claim to use no bleaching chemicals at all and are free from fragrances and lotions, too. Each diaper features a fluffy core that’s ultra-absorbent and comfortable to the skin. And just like other environmentally-friendly disposable diaper brands, this one comes with an FSC Certified Diapers label. The diaper comes with a waterproof outer layer that keeps it from being moist after the child has peed. The pull tabs are very adhesive allowing the diaper to fit very well and prevent the back from leaking when your baby is sleeping. It works very well in keeping baby’s skin free from rashes. The material looks like recycled paper towels, and the texture may be a bit rough for some babies. The diapers fit a bit smaller than other brands. 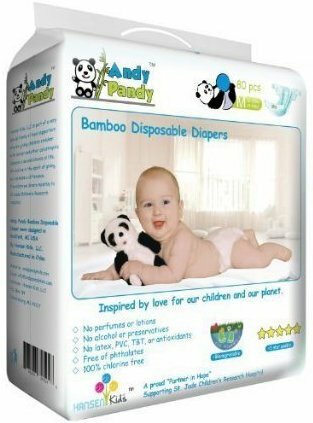 Andy Pandy is another brand that’s gaining popularity among the lines of eco-friendly disposable diapers. Many parents appreciate Andy Pandy diapers for their hypoallergenic and antibacterial qualities. They are said to be made from biodegradable bamboo, making them soft and gentle to the skin, yet durable and very absorbent. They also come with thermal regulating and moisture wicking capabilities, helping keep babies dry in both hot or cold weather. It features an elastic waistband that provides a comfortable, snug fit, plus a 3D form fitting design that prevents leakage. The diaper is soft both on the inside and outside. It has a yellow strip in the middle that turns bluish/greenish when wet. Diapers come in plain white and look classy. The diaper is too thin and soft and feels like it’s going to shred easily, especially when pulled too tightly. We found it difficult to choose a winner out of this lineup since all of them are clearly very impressive. For this reason, we based our decision on three criteria: Performance, Cost, and Environmental Impact. 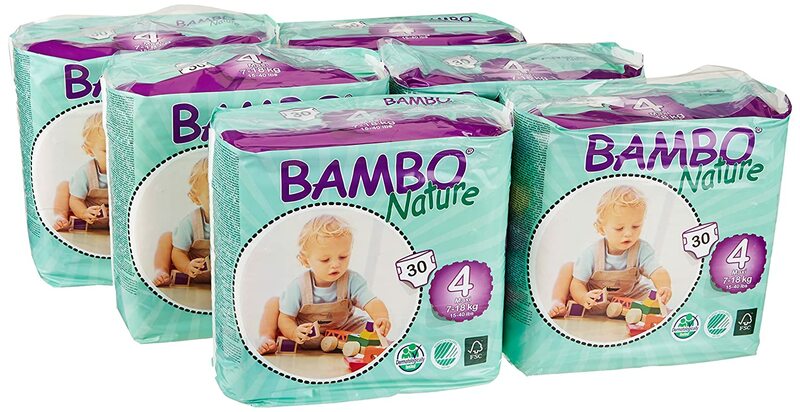 Based on these standards, the all-around winner is BAMBO Natural Diapers. Yes, the diapers are a bit more expensive than the rest since they are more costly to make. However, comfort- and absorbency-wise, they seem to perform better than their counterparts. The brand also carries the most eco-credentials, which means it can truly deliver in terms of keeping your child’s skin and the Earth healthy. What about you? What brand of disposable diaper do you use for your baby? Let us know through the comments section below. And oh, please don’t forget to share this post to get the word out to other parents out there! It was only in the 40s that real disposable diapers became available on the market, and boy, what a luxury they were that only a select few could afford back in the days. And yes, that means that people had to deal with baby poop in other ways for thousands of years prior to the invention of the modern-day nappy. The revolution was started in 1946 by Marion Donovan, a housewife and a mother of two, who, after being frustrated by the monotonous task of changing her younger child’s soiled cloth diaper, sewed their shower curtain at home to come up with a waterproof diaper cover. A year later, another woman, this time a Scottish housewife named Valerie Hunter Gordon, began developing a two-part disposable nappy made from old parachutes and cotton wool. Unlike Donovan, however, Gordon was able to have her invention patented successfully, and the rest was history. Throughout the 80s and 90s, the design of diapers continued to improve, becoming softer and lighter and integrating more absorbent fabric and attractive designs. Today, diapers are not only becoming thinner and more comfortable but more environmentally sound, as well. And with the technology available in our time, it looks as if disposable diapers will just continue to evolve. Now that we know how disposable diapers came to be, it’s time for us to look at some of the things to consider before deciding which brand to pick. Avoid choosing a brand just because it’s popular or only because your friends are using it, too. Think about your baby’s needs and yours. What’s your bottom line for picking a particular brand over others? Is it health? Is it the environment? Is it the cost? Do not buy in bulk until you have tried and tested a particular diaper for a period and are satisfied with its fit and performance. Wait to purchase your baby’s first diapers until you have known his weight. In most cases, you’ll only need a few packages for weights up to 10 lb. If you’re ordering diapers online, consider the delivery schedule. Time it so that it arrives at your doorstep even before you get home from the hospital. Absorbency is the most crucial trait of any diaper. Choose a brand that exceeds in this particular area. Find a diaper with not only outstanding absorbency, but also material that’s soft on baby’s skin. The securing tabs should have rounded and soft corners and need to stay in place despite your baby’s movements. Find a good fit for your child. You may or may not perfect this the first time, but that’s okay. Not all diapers are equal in fit, even if they belong in the same weight category. This is usually because of the material the diaper is made of. Softer diapers conform to the body nicely, while stiffer diapers leave gaps that result to leaks. Consider a diaper that’s chlorine-free, dye-free, and fragrance-free. The more chemical found in the diaper, the higher the chances your baby may develop rashes, especially if he has allergies or sensitivities. Pricing does not always influence the quality of a diaper. It’s possible to get a box of environmentally friendly diapers for the same price as regular diapers.